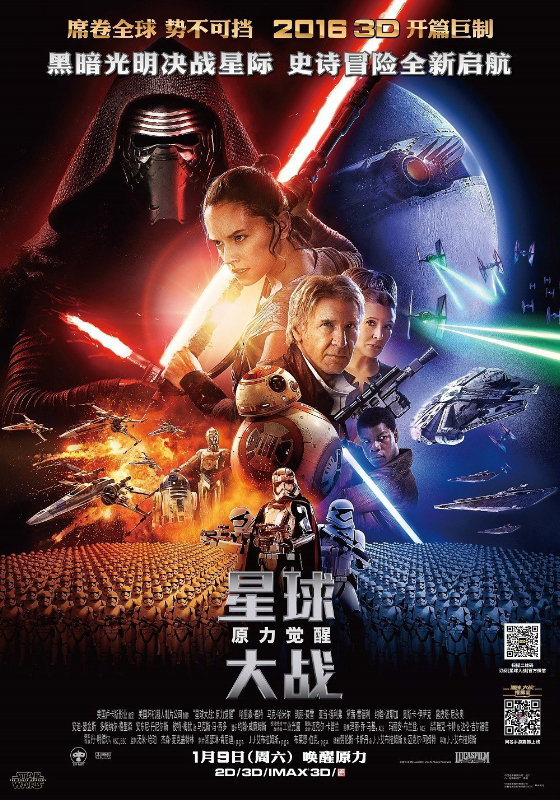 In 36 hours, Star Wars: The Force Awakens will descend upon China, three weeks after it hit the rest of the world. Although Hollywood is holding its breath to see what impact China’s box office power will have on the already-insane level of success the film is enjoying right now, China seems to barely notice that this movie exists. At least where we are, there are far fewer signs that it’s coming than you’d expect for just about any other big movie, foreign or domestic. 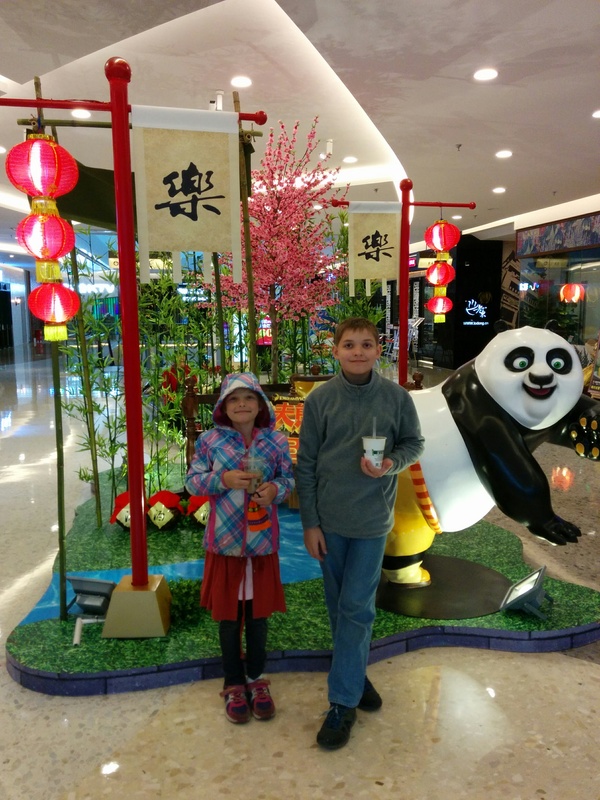 For example, about a week ago, we went to our nearest movie theater, located at one of the poshest malls in Kunming. We wanted to ask when tickets would go on sale for the January 9th opening. “Probably the 8th,” the clerk said. “Just keep checking your WeChat,” she added, referring to the social media app that all of China seems to run on. At that point, the movie had not even appeared on the theater’s “Coming Soon” board. So, just to make sure I’m tracking: the biggest box office cash cow of all time is coming to this country, yet ticket sales will only start the day before it opens? Yup, that’s about right. This is a mystery to me since China has become an exponentially bigger player at the box office in the past few years, but I guess I shouldn’t be surprised. Many things in China are a mystery to me. Like taxi shift change. Or padded teddy bear pajamas on grown men. Or this toilet seat cover. 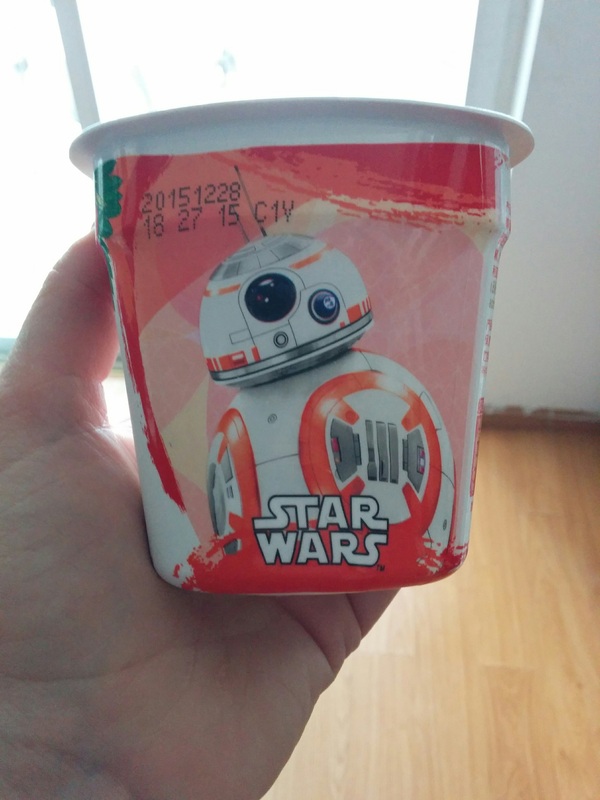 Many of my friends in the U.S. were lamenting how out-of-control the Star Wars marketing had gotten over there. Of course there are Star Wars T-shirts and Christmas ornaments, but there are also Star Wars coffee creamers, Death Star waffle makers, and light saber bbq tongs. Star Wars EVERYTHING. (“You can get Star Wars grapes,” one friend shared. “I still have not figured out the connection.”) Opening night tickets were going for $500 each (unless you happened upon Carrie and Ellen giving them away for free.) There was so much hype, the country nearly ended in an Alderaan explosion on December 17 at midnight. Here in China, it’s the opposite problem. There’s hardly any marketing at all. 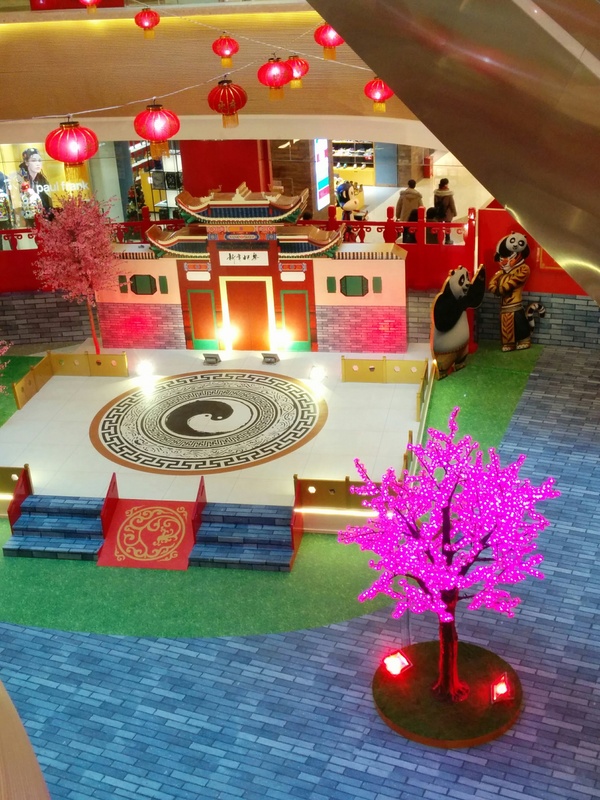 That same posh mall was absolutely covered in promotions for Kung Fu Panda 3. Signs lining every escalator, banners dangling in the atrium, displays on every floor, and a giant KFP3 playland for kids with life-size statues of Po and other characters. Oh, and a video address from Jack Black to “my friends in China.” Let’s keep in mind that this is for a movie that won’t come out until January 29. Meanwhile, the only blip on the Star Wars radar outside of the movie theater was this little Max Factor cosmetics ad stuck on the side of their kiosk. Outside of the mall, we’ve basically seen zilch. I would be able to say we have seen nothing at all, but that spotless record was broken two days ago, when my daughter bought a yogurt at a little convenience store here, and discovered this on the container. So that’s it. No bus ads. No elevator ads. No Force Awakens grapes. Not that I’m in favor of an all-out nationwide advertising blitz, but it sure seems like something doesn’t match up.There’s usually more advertising for big movies. Definitely a mystery. Is it because China is hoping to keep foreign competition down? Is it because the laobaixing really don’t give a fish’s tail about this movie? 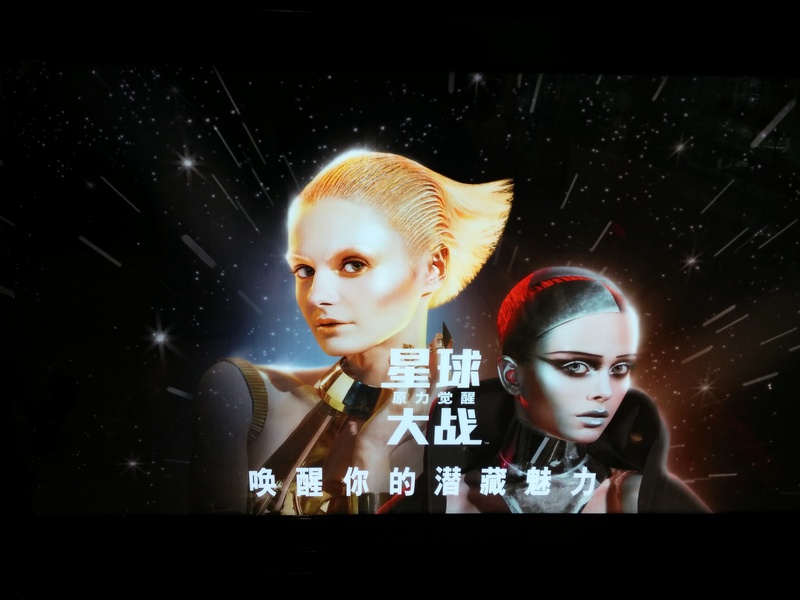 Are most people thinking, “Oh, yeah, I already saw that one,” because the name of The Martian in Chinese (星球救援) is really close to Star Wars (星球大战) and all white people look the same? I doubt it’s because the theaters aren’t interested in making money. They’re doing really well at that. Perhaps it’s because Kunming is not a first tier city, nor is it even a second tier city. I’m very curious to know what it’s been like in Beijing, or Shanghai. My husband alerted me that they’re trying publicity stunts over there, like Stormtroopers being stationed on the Great Wall or Stormtroopers buying cases of milk, but news of those things apparently hasn’t made it out to the wild west. No one’s talking about Stormtroopers or Rey or why Finn is smaller on the Chinese poster. I’m guessing for most Chinese citizens, even in big cities, Star Wars remains some weird foreign franchise that’s not worth getting excited about. We’ll see if I’m proven wrong on Saturday, when the theater has a whopping six showings on one screen (*sarcasm*) for opening day. Might just be sold out. P.S. I did keep checking my WeChat, and tickets went on sale the 6th instead of the 8th. I wasn’t able to buy tickets until today, the 7th, so I honestly was a little nervous that they might sell out. Silly me. When I purchased tickets, only four people had gotten their tickets before us. P.P.S. In the time it took to write this post, the theater has added an additional seven showings, for a total of 13 on opening day. Maybe they’re catching on that this could be big? There is more awareness in Beijing, although still nothing like the States! Subway (the restaurant) has had some Star Wars promotion since sometime in December, I’ve seen a bus stop billboard or two, and tickets went on sale last week sometime (I think). It does seem like there should be more hype for this movie, but there are lots of things about China that are baffling….. Thanks for that report on the Beijing situation, Ruth! Sounds like it’s not that much different from here. We’ll see if China catches Star Wars Fever this weekend, but so far, it’s pretty blah. Aside from Star Wars I clicked on the toilet seat. Unreality was the first word that came to mind. Who dreams up this nonsense. What do the Chinese think. Great points, Catherine. China doesn’t look at Han, Leia, and Luke with the same twinkly nostalgia that Americans do. It will be interesting to see what the box office numbers look like after this weekend. I loved it! It was quite a full theater, which was impressive. And the movie was apparently engaging enough to keep everyone off their phones. Hey there. Discovered your blog last week via a friend’s facebook share and I fell in love. I’ve been living in China myself for about 7 years and so this blog seems like a home cooked meal at grandma’s house to me! It’s so familiar and makes me laugh, cry, and yell AIYA at the same time! I’m very happy that you’re enjoying the blog, Matt! Thanks for that video. Interesting commentary. I hope you got to see Star Wars before you heard any spoilers. In that full theater, did other people get the references to previous episodes? It seems like at those moments, my husband and I were the only ones laughing! Star Wars TRULY isn’t a thing here!! We were sitting by other foreigners, so I had a hard time gauging the reaction from the Chinese audience members. I doubt there are many (any?) Star Wars superfans around here, so there’s a good chance no one else got the references, and of course, jokes don’t always translate well. We’ve certainly been the only ones laughing in theaters here before.